I didn’t want to have to tell you this, knowing what kind of emotional attachments can build up between faithful readers and the artists who are the focus of these reviews, but we’ve probably seen the last of Joe Swift on these pages, a short lived but much beloved member of the rock ‘n’ roll family. Swift’s sudden arrival last September with one of the best and most interesting records we’ve heard to date in That’s Your Last Boogie was followed in rather short order by a succession of somewhat lesser follow-ups in which his notoriously nasal baritone often threatened to, but never fully obscured, the lusty enthusiasm with which he sang. Though nothing matched that debut along the way his overall output was generally above average thanks largely to the solid craftsmanship of Swift the writer as well as the prodigious abilities of Johnny Otis’s crew who’d been enlisted to back him at every turn. Though a vexing performer whose strengths often battled his weaknesses to a draw, his presence in rock was still entirely welcome for the sheer vitality he added to the proceedings, but strangely, like so many others we’ll meet over time, his stay was destined to be a short one. Joe Swift, of whom we have so little biographical information on as to make him nearly a rumor, now begins to fade further into the mists of time. But fear not because rock giveths what rock taketh away (or something like that), as another phantom-like singer from the murky pages of history starts to come into view just as we’re waving goodbye to the disappearing apparition that was Joe Swift. His name is Smokey Lynn… Smilin’ Smokey Lynn if you prefer. Somebody with a similarly vague background whose historical legacy is just as lacking as Swift’s (although in his case, unlike Swift, at least we have some photographic evidence of his existence!). So for those of you who like these types of rock ‘n’ roll scavenger hunts, and I know that’s a lot of you, I’m pleased to say that Smokey Lynn is right up your alley. Before you get your archeological hats on and go digging in the library for secret passageways into the past, I should tell you that Smokey Lynn will have a longer career than Swift, on some far bigger labels besides, so there’s bound to be some more places to start your search. But in spite of a deeper résumé from which to work information on Lynn is not exactly in abundance on the internet, in music books or liner notes. In fact his life makes for a pretty good prototype for the witness protection program. 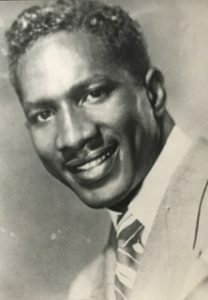 About all we know is he was from Texas (I think) and was a habitué of the Southern California club scene in the late 1940’s and early 1950’s and that he sang like he was battling the devil for control of his soul… and usually more than holding his own in the process. Anything else I suppose is superfluous when you get right down to it, for what matters most is what can be found on his records. So setting aside the question of WHO he was, where he came from and what his background might have been, we focus on what he did once he elbowed his way into the spotlight. Although Lynn is not exactly IN the spotlight here, as he doesn’t get top billing on this one either. Actually Don Johnson was a trumpeter born in Los Angeles in 1925, which already is more info than you can easily find on Lynn. But there’s another interesting connection to the aforementioned Joe Swift…. Namely Don Johnson recorded with none other than Johnny Otis (who didn’t in the late 1940’s?). This appears to be Johnson’s only session in which he was credited as bandleader and Otis was definitely not involved, nor were any of his other regulars. So who knows how Johnson found his way to Specialty Records with an entirely new outfit of musicians and managed to get his name on the record label as the featured artist no less (although, since this IS his only time credited as such, and since the record is prominent for Lynn’s role far more than Johnson, for the sake of continuity we’re listing it under Lynn’s name). But Johnson’s trumpet does play a prominent role here in a rousing intro with brass section racing out of the starting blocks before settling into a churning groove as the piano’s treble keys get a workout setting the stage for Lynn, who when he jumps in twenty-two seconds in shows himself to be a far more accessible singer than Swift ever was. Yet they do share one distinct trait which is their all-out enthusiasm which drips from the performance throughout. Lynn’s voice is strong without being too commanding. He’s a shouter in the classic sense, though without quite the deep resonance of Big Joe Turner and his many (lesser) acolytes. But Smokey has good control – and unlike Swift he doesn’t use his nose in place of his mouth – and generally speaking he never tries to do too much. He seems to take pride in his ability to hit and hold the loudest passages in full voice, something he uses as either an attention getting intro to lines or as a capper to others, but it’s certainly effective in conveying the proper excitement. Excitement is also what he does best, letting loose of his emotions with no regard for life and limb and pity you if you don’t watch out for flying shrapnel. Everybody taking a similar approach during this era would either be compared to Turner or Wynonie Harris, the two most prominent of the rock shouters, but Lynn isn’t indebted to either one. His skills are more overt and more narrow at the same time. Even compared to the often full-throttled Harris, Smokey Lynn has an urge to burn rubber off the line and shift into higher gears as soon as he starts to wind out. He can downshift effectively to handle the curves but it’s not long before he revs it back up looking to take off again. All of which means State Street Boogie isn’t a song with much nuance or lightness of touch, but rather a prime example of arriving late to a party already in full swing, hearing the growing din from down the street as you approach, then opening the doors and having this assault the senses as you enter, almost knocking you back out onto the sidewalk in the process. You may be stone cold sober as you walk in but by the chorus, whether or not you’ve even made it to the bar to place your order, you’re already feeling drunk. Musically Johnson’s crew handle their business well. The sax solo is particularly exuberant, if a little sloppy at times, but it’s the group horn work that just keeps riffing behind Lynn that really propels this. Right from the start it’s hitting on all cylinders, never trying to do more than what’s required to keep it moving. If there’s a lesson to be learned for aspiring musicians it’s simply that you need to adhere to the song’s stated purpose. For a lot of the jazz expatriates over rock’s first two decades who found themselves enlisted to back up low-brow singers for equally low-brow audiences this was a constant struggle, as they viewed such simplicity as being beneath their talents and they yearned to break free and show what they were capable of. But if showing off their ability to improvise complex arrangements were all it took to find fame and fortune then they should’ve moved into bop where that was the primary objective. In rock it wasn’t (though in time, by the late 60’s, ironically enough when those who cut their teeth in jazz were no longer needed for rock sessions, the rock instrumentalists themselves would often fall prey to the same urge to focus the spotlight on them and lose track of the structured song’s intent) and so for those like Johnson and company their ability to let go of their egos and maintain the discipline needed for such a rudimentary arrangement is worthy of praise. It’s also not the easiest thing to do despite its relatively simple concept. There seems to be just one thought in mind for all of them which is to hurtle down the track full speed ahead. Usually that can be a recipe for disaster, even amongst the most talented of bands (see Crown Prince Waterford’s Coal Black Baby for evidence of this), but somehow these guys all manage to keep things from going off the rails. Lynn for his part is helping matters by using just enough restraint at times, easing back when the song calls for it, to make sure it doesn’t get too out of control. The lyrics of course lead nowhere as this brand of song rarely has any deeper meanings to be found, it’s merely a loose collection of boogie-based exhortations that serve its basic purpose of never letting up on the gas. You could substitute any of about three dozen other lines you’ve picked up in similar modeled songs over the years and likely nobody would notice the difference. But that’s also what makes it so enduring. Though the accoutrements pretty definitively date this as a song coming from 1948-1952 or so, the overall structure is so familiar that it doesn’t seem out of place mixed in amongst other songs from other eras. I suppose if you want to be perfectly honest what is offered up on State Street Boogie is fairly generic. There’s nothing about it that leaps out at you as being ahead of the curve, such as what we encountered the first time we met Joe Swift on That’s Your Last Boogie. But generic isn’t the same as run-of-the-mill no matter what your thesaurus might claim. There’s a definite skill in making something so ordinary in concept sound fresh, alive and authentic. Keeping the Swift comparison going (which isn’t fair to either one but I’m too far along to change direction now), while I don’t think Smokey Lynn, Don Johnson and the boys aimed nearly as high as Joe Swift and Johnny Otis did each time out, they also achieved more cohesion between those aims and their output here. In the final analysis they knew exactly what they were striving for and hit every note, every vocal inflection and every emotion with precision. None of it may have been a tall order on paper, but as we’ve seen time and again that doesn’t always make much difference once you get in the studio, as even the best artists fail to keep focused on their goals for the three minutes or so of the master take. These guys have no such problems. It’s efficient in a way that is hard not to commend and the wild free-for-all spirit they maintain, even while keeping it within the required boundaries of musical sensibility, is so infectious that it makes you want to hand a copy of this record to every act that signs a contract and tell them to study it carefully so they might learn to balance the demands of hitting on a loose feel while still playing and signing in tight formation. That so few over the years have managed to do so consistently in their attempts shows just how difficult a feat it really is. Leave a reply on "Smilin’ Smokey Lynn (Don Johnson And His Band): “State Street Boogie”"